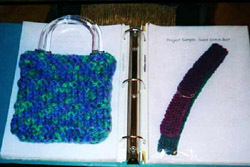 In the fall of 2003, I decided to embark on the path to Master Knitterdom. Sure, I wanted to advance my skills, but what my egocentric little mind really wanted was the coveted "Master Knitter" pin and certificate. So I joined TKGA (a requirement to be in the program) and sent in my money, currently $30 for Level 1. A week later, I received a folder containing a photocopied packet of instructions. I was ready to go! I was so motivated to finish Level 1 that I got through it in only 9 days! 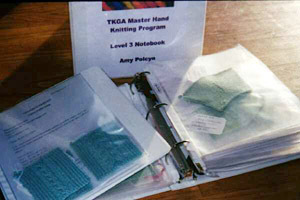 Once I had all of my swatches and written work (16 swatches, 14 questions, and 1 report for Level 1) organized in a binder, I mailed it off to TKGA. About a month later, I heard back from the review committee. I passed! On to Level 2. Level 2 (21 swatches, 17 questions, 4 book reviews, 1 report, 1 vest, and 1 argyle sock) took considerably longer to complete, mainly because of the vest. I started in December of 2003 and was finished the following July. I was elated. Not only was I (almost) one step closer to Master Knitter status, but I really improved my skills, particularly with Fair Isle knitting and seaming. Working carefully to ensure my swatches would pass muster with the very high standards of the committee meant I had to rip out and start over a few times, and practice techniques until I got them right. It was also a great excuse to buy some more knitting books! When my notebook came back, I had a few corrections to make to some of the patterns I wrote (I forgot to include the metric needle size, among others) before I could officially pass, but thankfully I had nothing to reknit. Currently, I am working on Level 3, and hope to finish up this summer. Working on the swatches in particular is great for the warmer months, since they're small and don't get hot and sweaty in your lap. I have learned so much through the program -- I now feel competent knitting just about anything, and don't get put off by even the trickiest of patterns. The best part is that now I can design my own sweaters, even complicated ones, something I was terrified of before. Of course, I'm still looking forward to "getting pinned" at a TKGA conference once I pass the final level! Okay, maybe I'm a glutton for punishment (or my thirst for recognition is really severe!) but this past summer, I also enrolled in the CYCA Correspondence Certified Instructor's Program. Am I planning a career as a knitting teacher? Probably not, but it would be nice to know I'm qualified just in case. Plus, CYCA sends participants a pin and certificate for each level, not just at the end. Bonus! In Level 1, students knit sample swatches for increases, decreases, basic cables, ribbing, plus a self-designed beginner project and pattern. It took me only about a week to prepare all of the materials for Level 1, but a bit longer to get through the student teaching hours (luckily I have people around me who want to learn!). The most important lesson I learned trying to teach others was that everyone has their own knitting style, and the teacher must be able to adapt. Good for me to learn, I'm sure! When I completed my 15 hours, I sent my lesson plan binder with my swatches and the beginner projects I'd created to my teacher, designer Evie Rosen. CYCA fancies a more intimate approach to feedback, so students are asked to set up "interview" appointments with their teacher. The teacher asks the student various questions to test their knowledge of knitting and of teaching techniques, as well as providing feedback on the submission. Anyway, don't be afraid of the ego trip that comes along with completing either of these programs. It's good for you AND your knitting. Especially your knitting. Good luck! Amy teaches 1st and 2nd grade gifted students by day, and spends way too much time knitting by night.